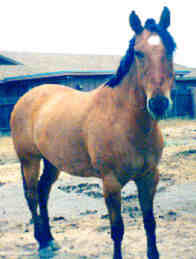 Hobo is my oldest horse right now. He is 19 years old and I have had him since he was about six months. Hobo has done just about everything. He has been in several parades, and shows. My little sister rode him to high-point in her age group one year in English pleasure and Hunter-Jumper classes. He was also trained in Dressage by my sisters riding instructor. Hobo spend a couple years ponying racehorses at the track. I have ridden him sidesaddle, and he has also ben used as a cavalry mount for Civil War re-enactments.